The bolo bao or pineapple bun is a confusing pastry. Mostly because there’s no pineapple in it at all! The Chinese bakery we get ours from actually specifies this on the sign, probably so that customers don’t complain about the lack of fruit filling. It’s actually called a pineapple bun because the crunchy, yellow topping that sits on each bun kind of, maybe, looks like a pineapple… if you squint. I love bolo bao – that sweet, dense pastry. My favourite are the ones filled with coconut. So clearly, I made it into an ice cream. 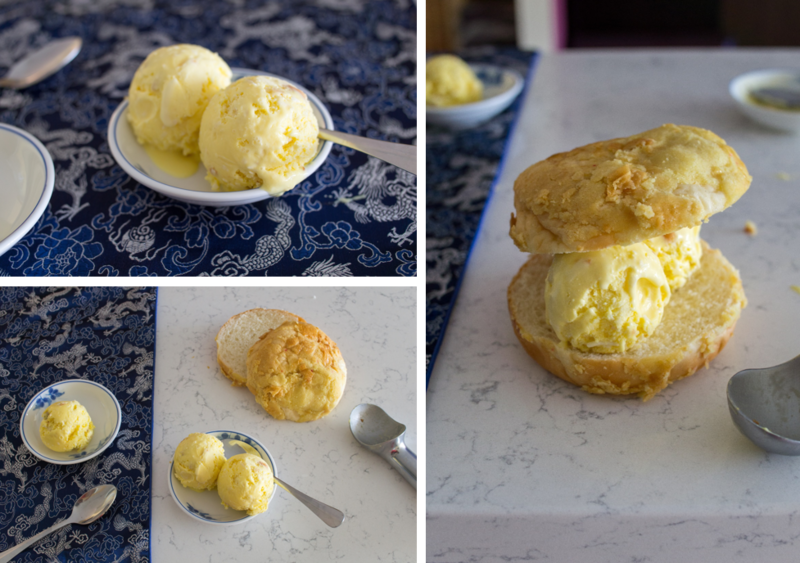 I was inspired by the peanut butter croissant ice cream from Death in Venice. Though not their most adventurous flavour, I was surprised at how well a pastry, like a croissant, worked in ice cream. 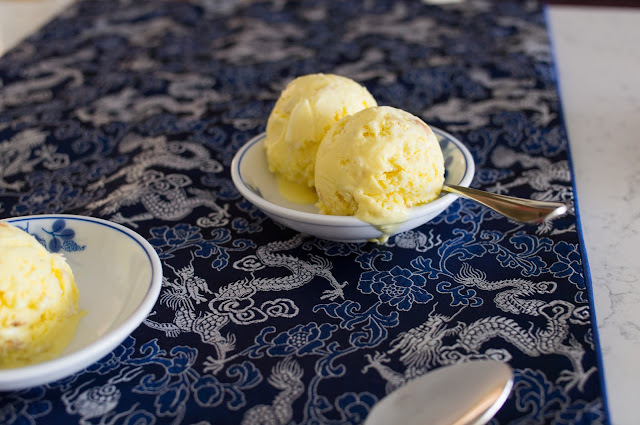 And so the bolo bao ice cream was born. 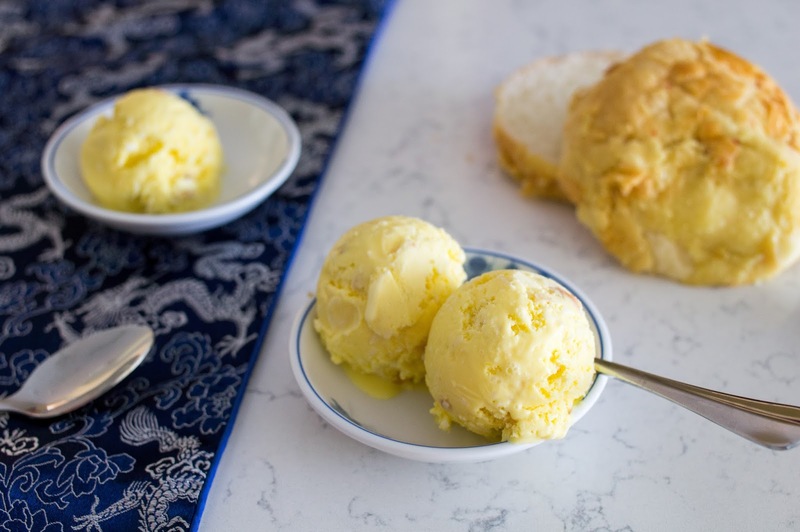 It’s a plain vanilla ice cream, but made with extra egg yolks to add richness and give it that classic bright yellow colour of the pineapple bun. The ice cream is then combined with dried coconut and chopped up bolo bao. The buns don’t get hard. They just add an interesting texture to the ice cream. Of course, if you’re not a coconut fan, skip the coconut! 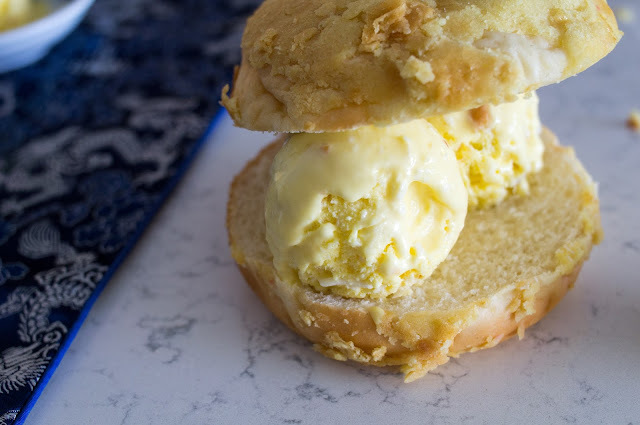 We ate this ice cream on its own and also sandwiched inside a bolo bao, like bolo bao inception. Both were awesome. It’s summer, it’s hot, ice cream it up! Looking for more frozen treats for the hot days of summer? Check these out! Churn in your ice cream maker according to its instructions. While the ice cream is churning, but your bolo bao into small 1 cm pieces. 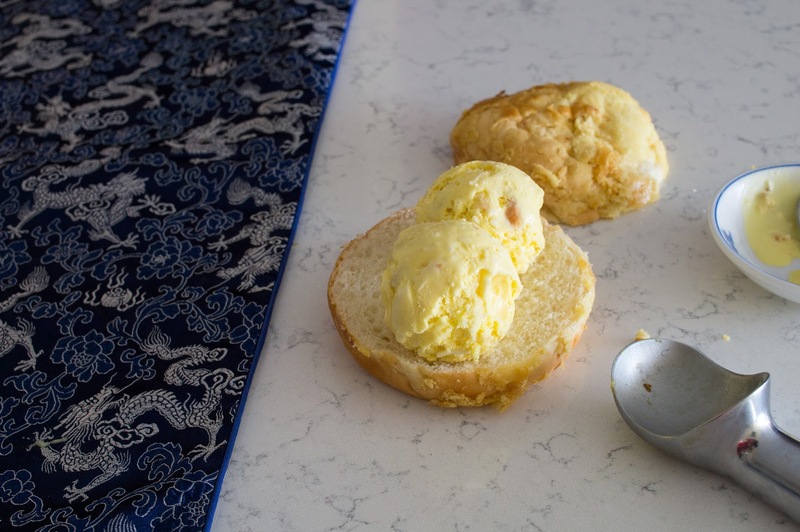 Once churned, stir bun pieces and coconut into ice cream. Freeze.